Cycling is a conservative and dogmatic sport. At the highest level, the pro peloton is slow to embrace technical innovation, often preferring the tried and true over the latest and greatest. This mindset seems to filter down to all levels of cycling. Triathletes, on the other hand, are usually eager to whip out their wallets for every trendy or newfangled product. They are unencumbered by the traditions and mores of cycling, perhaps a consequence of the relative youth of their sport. Compression gear? Hologram bracelets? Seat leashes? Hell yes, I’ll take three! While this tendency sometimes leads triathletes astray, being open minded has its advantages. Compact cranksets are becoming increasingly popular, a trend driven not only by aging baby boomers and the rise of recreational cycling, but also by a growing number of competitive athletes realizing their benefits. While compacts are sometimes derided by self-professed “serious cyclists”, some of the world’s best have put compacts to great use. The cycling industry has warmed to compacts, with ever more crankset models and compact-specced bikes available. After realizing how much I loved the compact on my utility/adventure/cyclocross/commuter/gravel bike and crunching some numbers, I made the switch to compact on my triathlon bike. In this post, I hope to convince you that compact cranksets merit consideration from cyclists and triathletes of all levels, from beginners to weekend warriors to pros. Compacts definitely aren’t for everyone (more on that later), but I believe that the majority of cyclists and triathletes could improve their performance and enjoyment of the sport by making the switch. Tyler Hamilton pioneered the use of compact cranks at the 2003 Tour de France with a solo breakaway stage win. What is a compact crankset? The terms “compact” and “standard” refer to the a crankset’s bolt circle diameter (abbreviated as BCD). 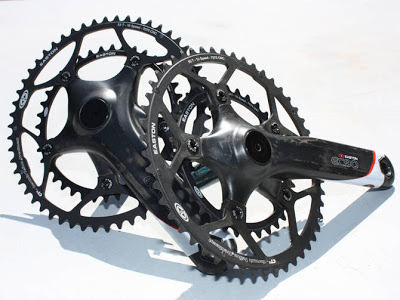 Modern cranksets for road bikes are typically 110 BCD (compact) or 130 BCD (standard) (with 135 BCD Campagnolo cranks being a notable exception). Compacts most often feature 50/34 chainrings (i.e. big ring = 50 teeth, small ring = 34 teeth) while 53/39 is the most common option for standards. More recently, the term “mid-compact” has been used to describe 52/36 or 52/38, but strictly speaking, these cranks are compacts (110 BCD). Compact and standard. Can you spot the difference? Is compact right for you? Compact-curious cyclists come from two camps: those riding triples cranksets and those riding standard double cranksets. For many reasons and for many applications, compacts paired with super wide range cassettes (e.g. SRAM WiFLi) are supplanting triple cranksets. This post is mainly addressed to triathletes and cyclists riding standard doubles. Some sources recommend compact or standard cranksets based on power output. Sometimes 4 W/kg is cited as the threshold above which a standard crankset is a better choice. I don’t see much value in this approach since crankset selection is also a function of preferred cadence, terrain and riding style. For example, although I averaged ~4.5 W/kg in my last Olympic triathlon, I was quite happy with a compact due to the hilly course and my naturally high cadence. To determine if a compact is right for you, I suggest reading this article, playing with a gearing calculator and observing what gears you actually ride in (as opposed to what’s on your bike). Specifically, are you ever running out of gears, never using certain gears or having to stand to climb every hill? What are the benefits of compact cranks? 1. Compacts can provide a wider gear range, especially at the low end. This makes it less likely you’ll run out of gears and be forced into a suboptimal effort level, power output or cadence range (e.g. grinding up a hill). To illustrate this, let’s compare two popular gearing choices: a 53/39 standard crank with a 12-27 cassette and a 50/34 compact crank with an 11-25 cassette. The comparison could be done in terms of gear inches or ratios, but most people find it easier to relate to speed. *Assuming 700c wheels, 23mm tires. Choice of cadence does not affect conclusions. So in this example, the compact not only provides a lower gear, but also a higher gear than the standard! 2. Compacts are more than enough for most. The previous example showed the surprising fact that 50×11 is actually a bigger gear than 53×12. But you may be thinking, “hold on, I have a standard with an 11 tooth sprocket in my cassette”. The question is, will you really miss your 53×11 top gear? Think about how much time you spend pedaling above 50 km/h. The answer for most cyclists in most circumstances is “not much” (with some exceptions listed below). 53×11 at 90 rpm is about 54.6 km/h, or about 3 km/h faster than 50×11. Is it worth giving up the lower gearing of a compact for the marginally higher top gear of a standard? I would argue that it’s potentially a lot more damaging to your overall performance to run out of gears at the low end (e.g. on a big hill) than at the top end (e.g. on a big descent). Ask anyone grinding up a climb if they would trade their top gear for some lower ones! Compacts are still capable of some serious speed. Let’s assume that you “spin out” around 110 rpm, the maximum cadence you could comfortably pedal at for short periods of time. At this cadence, 50×11 nets you 63 km/h! Personally, this is about the speed at which I stop pedaling, get low on my bars, tuck in my knees and coast. 3. Not only can compacts provide a wider range, but they allow tighter gear spacing. You can have your cake and eat it too! With a standard, many cyclists require a big cassette such as 11-28. With a compact crank, a smaller cassette, such as 11-23 or 11-25, may suffice under most circumstances. Smaller cassettes have smaller jumps between gears making it easier to find the perfect gear. With tighter gearing there is also less disruption in cadence and power output when shifting. An 11-23 road cassette and 11-38 MTB cassette. 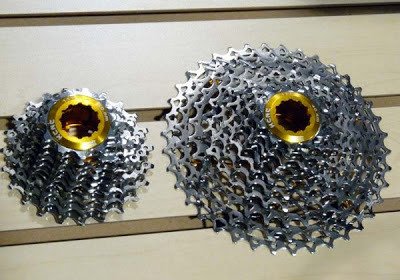 These two extremes show how gear spacing increases with cassette size. 4. Compact setups can have fewer redundant gears compared to standards. Looking at the graph above, you can see that there is less overlap in the ranges covered by the big and small chainrings. This is because compact 50/34 rings have a 16 tooth differential (the max most front derailleurs can effectively accommodate) compared to a 14 tooth differential for standard 53/39 rings. 5. Compacts can improve chainline resulting in improved drivetrain efficiency. Chain drives are very efficient provided the chain runs in a fairly straight line. “Chainline” refers to how straight the chain runs between a chainring and a cassette sprocket. Perfect chainline occurs when the chainring and rear sprocket are in the same plane. The more crooked the path of the chain, the greater the power-sapping frictional losses and wear on drivetrain parts. For this reason, you should avoid certain gearing combinations: big chainring to biggest rear sprocket and small chainring to smaller rear sprockets. The gearing combinations on the left maintain good chainline. From my own experience and from observing other cyclists, people who are overgeared on standard cranks (i.e. many people) spend too much time in their small chainring and small rear sprockets or even *gasp* cross-chained. Since switching to compact, I’m able to avoid these bad gearing combinations. 6. Related to the previous point, a compact allows you to tackle more terrain in your big chainring meaning less front shifting. This produces less wear on the chainrings, chain and front derailleur. There is also less risk of dropping your chain. An added bonus is that frictional losses are minimized in the big ring because the chain makes a wider radius bend than in the small ring. 7. Compacts are more versatile due to more chainring options. The smallest chainring compatible with standard cranksets is a 38, while compacts can go as low as 33. 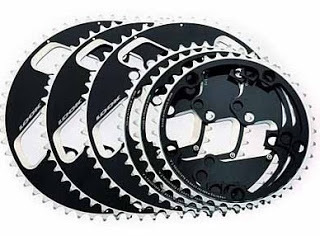 At the other end of the spectrum, compact chainrings are commonly available in 53 and can be as monstrous as 56 teeth! So you can effectively turn your compact into a standard if need be. Chainrings can be relatively inexpensive and swapping them only takes a few minutes. It can therefore be practical to have a selection of rings to choose from based on course conditions. For example, 50/34 serves me well for most triathlon courses, but I may opt for 52/36 on a course with a long gradual downhill or tailwind section. Just because most compacts come with 50/34 rings doesn’t mean you’re stuck with that combo. 8. Here’s one for triathletes: Compact gearing is conducive to pedaling with a higher cadence which may benefit off-the-bike running. At least one study found that increasing cycling cadence benefited subsequent running performance. But the research is conflicting with other studies finding that a lower cadence benefits running or no relationship between cadence and running performance. One caveat is that the duration of exercise examined in these studies was much shorter than most triathlons (<1 hour). In summary, a higher cadence may improve your off-the-bike running and you should experiment to find out. 9. Compacts are lighter due to the smaller spider, smaller chainrings, shorter chain and potentially smaller cassette. All of these factors could add up to a modest weight savings of 100 grams or more. 10. Compacts may facilitate shorter cranks. There has been a trend towards shorter crank arms among triathletes and time trialists, primarily to allow a lower and more aerodynamic position by opening the hip angle. This, in turn, can lead to improved off-the-bike running. While crank length remains controversial, some studies have shown that its effects on power output or metabolic efficiency are small or insignificant. Assuming this is the case, cyclists are free to choose crank length based on comfort and aerodynamics. Unfortunately there is no obvious conclusion regarding crank length and gearing. You’ll have to try it out for yourself! BONUS: Compact gearing may be slightly more aerodynamic due to the smaller chainrings and cassette. Yes, aeroweenies think like that. If compacts are so great, why isn’t everyone riding them? You are an exceptionally strong cyclist. You prefer a low cadence. Some people are grinders, some are spinners and that’s ok. Experienced cyclists find success with a broad range of cadences. There is no single optimal cadence for every cyclist for every ride (i.e. distance, intensity, elevation profile, etc.). Most of your rides involve fast-paced drafting and/or sprinting. Both may require higher gearing. You expect to average over 50 km/h for an extended period of time. This may occur on a particular course due to hills or a tailwind. Just keep in mind that you’ll spend even more time pedaling up the hills or into the tailwind (unless it’s a point-to-point course). Your bike has 650c wheels, as opposed to the 700c norm. The smaller wheel radius means that you need to push bigger gears to achieve a given speed. Your bike isn’t compatible with compact cranksets. Some frames have braze-on front derailleur tabs that are too high to accommodate compact cranks. This is rarely an issue these days. Are there any other downsides to compacts? All else equal, larger chainrings are slightly more efficient. At a given speed and cadence, a standard crankset uses a larger chainring and cassette sprocket than a compact. As a result, the chain makes wider radius bends resulting in less power lost to friction. Also, all else equal, larger chainrings wear a little more slowly than smaller ones because the chain meshes with more teeth. What does the future hold for compact cranks? Thankfully, choosing between compact and standard may become a thing of the past. The new Shimano Dura Ace 9000 group has done away with 130 BCD altogether, instead offering only a 110 BCD crank with a broad range of available chainrings. Let’s hope other companies follow suit.